Home » ABOUT US » Current Projects » Save the Crown! 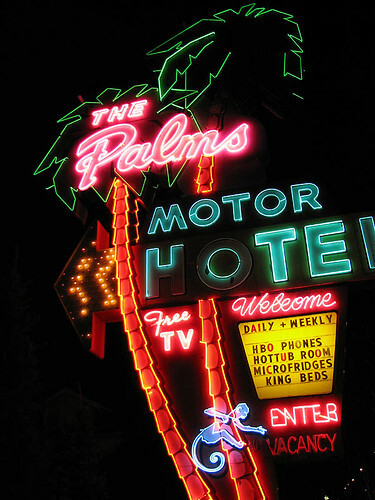 In early 2008, members of the MCM League (formerly the Atomic Age Alliance), led by former president Alyssa Starelli, formed a coalition to rescue the unique, forty foot neon sign of the Crown Motel from certain destruction. Built in 1959, the motel was slated for demolition in favor of new development, and no accommodation had been made for its beautiful, aging sign. 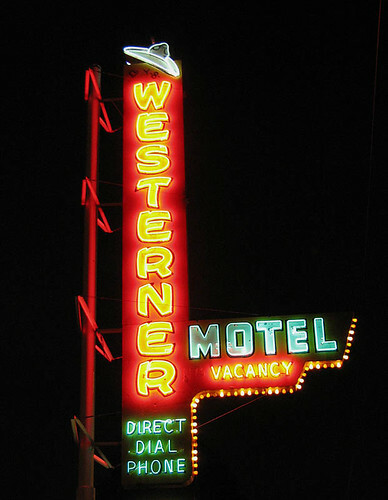 Though the motel itself had become an icon for the declining fortunes of the North Interstate corridor, its sign represents the distinctive artistry and overall historical significance of similar mid-century establishments and signs along the street. Starelli and the League recognized its importance to the vintage character of the neighborhood and stepped in to save it. The motel could not be saved (and probably wasn’t worth saving), but at the sign was rescued and moved off-site for restoration. Collaborating with staff from the city’s planning and development agencies, the League also pushed for the formation of the North Interstate Neon District, to allow period signage, such as the Crown sign, to be removed, restored and returned to the avenue, in order to preserve the “neon” aesthetic of the historic route. Previous zoning laws prevented these grandfather signs from returning to their original sites if they were removed for any reason, including repair or improvement. Photos courtesy of MCM League and Vintage Roadside. Working with Mayor Sam Adams, PDOT and BDS, we have designated an ideal site on North Interstate Avenue and are taking steps to meet the criteria required by the city to use the site in perpetuity. We are also working with the Office of Sustainable Development and Sustainable Solutions [LLC] on the possibility of powering the Crown Motel sign and other historic neon signs in the District with solar power. Make a tax-deductible PayPal donation! Now that the sign has been rescued and stabilized, our most urgent need is fundraising for the physical restoration. The sign is currently being housed indoors with the generous support of Arciform LLC, a local design-build company. The MCM League has also joined forces with neon experts Michael Mintz of Sparky’s Neon World, and David Benko of Rocket City Neon, to complete this first phase of the project. Once restoration is complete, ongoing sponsorship and a permanent site on Interstate must be found. But the work has just begun. Initial estimates to fully restore the sign run between $40,000 and $60,000, and we are working with an all-volunteer crew. We need your support! Please consider joining our sponsors in the support of the Crown Motel Sign Project. Your donation is tax-deductible, and we offer many long and short term sponsorship opportunities for the restoration and stewardship of this unique piece of Portland history. Why is the Crown important? It wasn’t a landmark in and of itself. It was just another motel on the road into Portland, and not as impressive as many of the others. But as part of a larger whole, it represented the emerging car culture and the post-war explosion of growth in the Western U.S.
North Interstate Avenue is Portland’s own little version of Route 66. From the 1940s to the 1960s, it served as the primary route between Portland and Seattle, part of U.S. Highway 99W. This was the golden age of the automobile in America. Gas cost twenty-five cents a gallon. Motels, service stations, restaurants and bars sprang up along the road in and out of Portland. Business was booming. 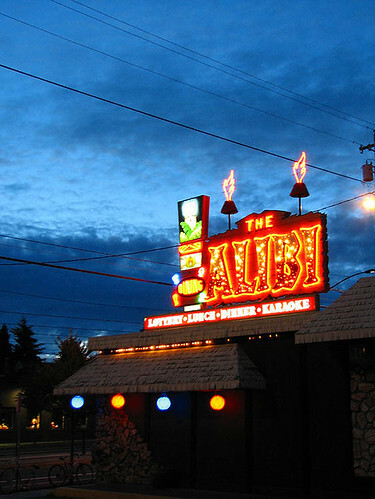 The glittering neon of the North Interstate strip was a beacon to travelers up and down the coast and throughout the Pacific Northwest. Photos courtesy of Vintage Roadside. Unfortunately, the success of the automobile meant the demise of the very culture it engendered, as the mighty interstate system rolled out across the country, and Interstate 5 was completed in the 1960s. The new freeways efficiently bypassed local commercial strips like North Interstate, and as a result, the avenue spent the next few decades in decline. Businesses closed, people moved away, and crime increased. Properties fell into disrepair. Understandably, the people of Portland forgot about the street’s rich history when faced with the growing blight. As buildings were razed and replaced in the push for urban renewal, little care was taken to preserve the structures and styles that made the route great. In 2000 construction started on a new MAX light rail line along Interstate, and renewal efforts began in earnest in the neighborhood. New restaurants, apartments and condos, shops and other businesses are helping to transform the street into a vibrant area once again. Having survived half a century and found rebirth, North Interstate is waking up to its importance in Portland’s history. City officials and citizens are making efforts to preserve, restore and grow Interstate’s remaining pieces of nostalgia along old Highway 99, especially its distinctive mid-century neon signs. The Mid-Century Modern League continues to be a leader in these efforts, providing a sustainable model for urban preservation efforts, and taking steps to save endangered landmarks. We envision a day when the North Interstate Neon District becomes a popular destination, much like the neon district on Wilshire Boulevard in Los Angeles, or historic Fremont Street in Las Vegas. It will become a glowing (literally!) tribute to America’s mid-century automobile culture, and a feature that invites increasing tourism and retail traffic to this revitalized Portland neighborhood.